Can beacons boost sales and cool factor? Once the hip place for college kids to load up on ironic T-shirts and random tchotchkes, Urban Outfitters is now trying to get some of its coolness back through mobile marketing. The retailer is loading up 15 stores in Philadelphia, Boston, New York, Atlanta, New Jersey and Delaware with beacons—small devices that marketers place around stores that ping messages at shoppers who have downloaded the retailer's app. Unlike most retailers that favor iPhone apps versus Android ones, Urban Outfitters is rolling out the technology first to Google-powered phones since more of its consumers use the devices. Swirl, the platform that powers the beacons, said that two-thirds of consumers shop in-store with a smartphone. And instead of pushing aggressive offers at smartphone-wielding consumers, the beacons plug into the Urban On loyalty program, a section in the app that gives shoppers rewards and access to events. "It's not just about delivering coupons and offers. They already do a lot of things with mobile with their engagement and loyalty program and social media. One of the things they wanted to do was extend those experiences in-store using mobile," said Rob Murphy, vice president of marketing at Swirl. 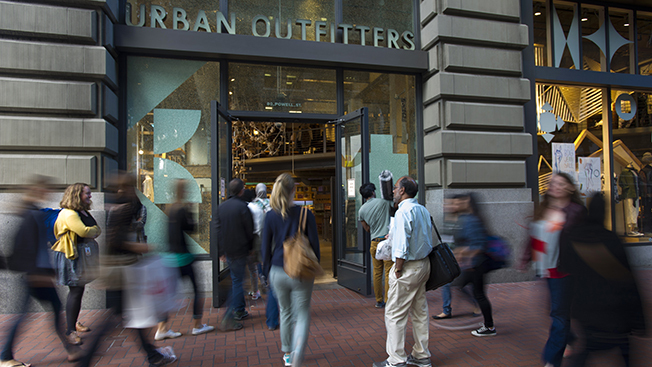 Initially, Urban Outfitters has pinpointed three areas to focus its mobile efforts around: the checkout line, fitting rooms and the entrance. When smartphone-wielding shoppers first enter the store, a push notification prompts users to check-in via social media to unlock an offer. Then in the fitting room, beacons are being used to churn out user-generated content about products. Shoppers are prompted to take selfies and post them to Instagram with the hashtag #UOonYou for a chance to be featured on Urban Outfitters' website. Shoppers at the register may get a push notification promoting them to shake their phone to show the Urban ID—a loyalty card—and earn a digital badge.